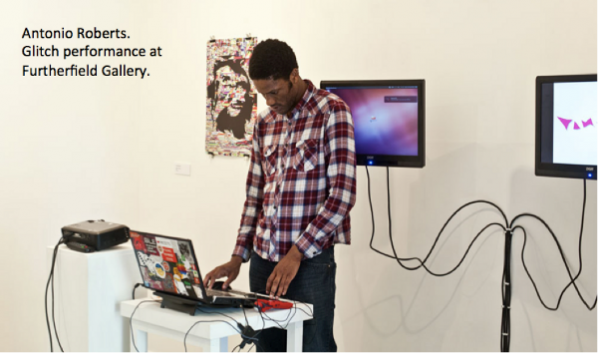 For over 17 years Furtherfield has been working in practices that bridge arts, technology, and social change. Over these years we have been involved in many great projects, and have collaborated with and supported a variety of talented people. Our artistic endeavors include net art, media art, hacking, art activism, hacktivism and co-curating. We have always believed it is essential that the individuals at the heart of Furtherfield practice in arts and technology and are engaged in critical enquiry. For us art is not just about running a gallery or critiquing art for art’s sake. The meaning of the art is in perpetual flux, and we examine its changing relationship with the human condition. Furtherfield’s role and direction as an arts collective is shaped by the affinities we identify among diverse independent thinkers, individuals and groups who have questions to ask in their work about the culture. 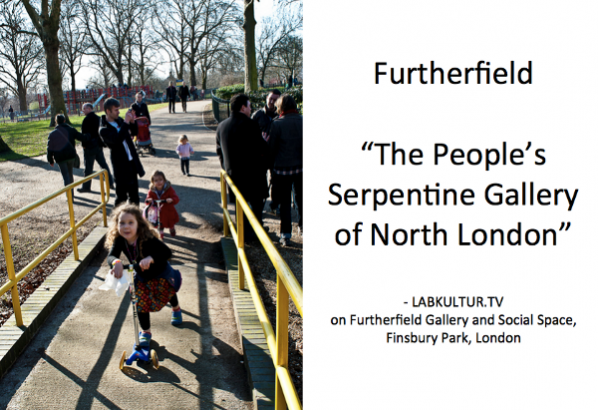 Here I present a selection of Furtherfield projects and exhibitions featured in the public gallery space, we have ran in Finsbury Park in North London for the last two years. I set out some landmarks on the journey we have experienced with others, and end my presentation with news of another space we have recently opened (also in the park) called the Furtherfield Commons. Running themes in this presentation include how Furtherfield has lived through and actively challenged the disruptions of neoliberalism. The original title for this presentation was ‘Artistic Survival in the 21st Century in the Age of Neoliberalism’. The intention was to stress the importance of active and open discussion about the contemporary context with others. The spectre of neoliberalism has paralleled Furtherfield’s existence, affecting the social conditions, ideas and intentions that shape the context of our work: collaborators, community and audience. Its effects act directly upon ourselves as individuals and around us: economically, culturally, politically, locally, nationally and globally. Neoliberalism’s panoptic encroachment on everyday life has informed Furtherfield’s own motives and strategies and, in contrast with most galleries and institutions that engage with art, we have stayed alert to its influence as part of a shared dialogue. The patriarch, neoliberalism, de-regulated market systems, corporate corruption and bad government; each implement the circumstances where us, everyday people are only useful as material to be colonized. This makes us all indigenous peoples struggling under the might of the wealthy few. Hacking around and through this impasse is essential if we are to maintain a sense of human integrity and control over our own social contexts and ultimately to survive as a species. It is no longer critical, innovative, experimental, avant-garde, visionary, evolutionary, or imaginative to ignore these large issues of the day. If we as an arts organization, shy away from what other people are experiencing in their daily lives and do not examine, represent and respect their stories, we quite rightly should be considered as part of an irrelevant elite, and seen as saying nothing to most people. Thankfully, there are many artists and thinkers seriously taking on these human themes in their work in various ways, on the Internet and in physical spaces. So much so, this has introduced a dilemma for the mainstream art world regarding its own relevance, and whether it is really contemporary anymore. 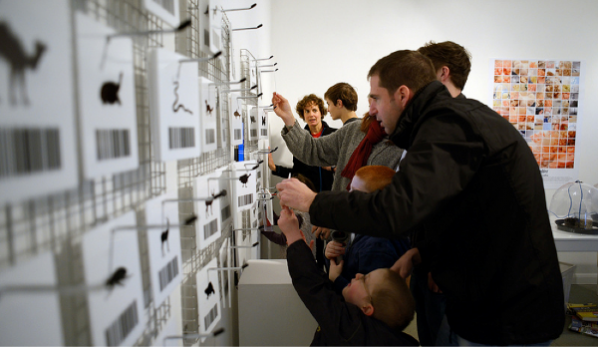 Furtherfield has experienced in recent years a large-scale shift of direction in art across the board. And this shift has been ignored (until recently) by mainstream art culture, within its official frameworks. However, we do not only need to thank the artists, critical thinkers, and hackers and independent groups like ours for making these cultural changes, although all have played a big role. It is also due an audience hungry for an art that reflects and incorporates their own social contexts, questions, dialogues, thoughts and experiences. 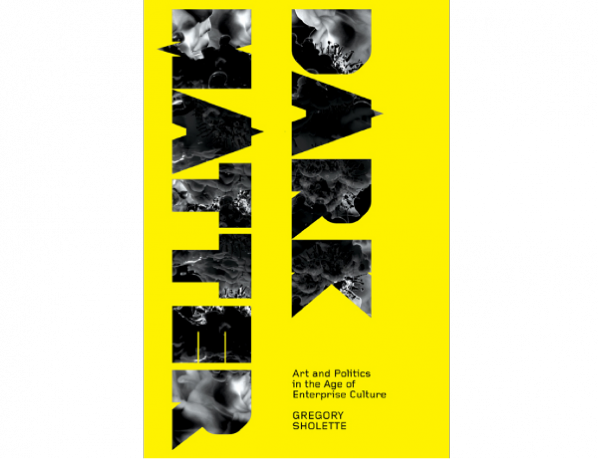 This presentation provides evidence of this change in art culture, and its insights flow from the fact that we have been part of its materialization. This is grounded knowledge based on real experience. Whether it is a singular movement or multifarious, is not necessarily important. But, what is important is that these artistic and cultural shifts are bigger than mainstream art culture’s controlling power systems. Make no mistake, this is only the beginning and it will not go away. It is an extraordinary swing of consciousness in art practice forging other ways of seeing, being, thinking, making and becoming. Furtherfield is proud to have stuck with this experimental and visionary culture of diversity and multiplicity. We have learned much by tuning into this wild, independent and continuously transformative world. On top of this, new tendencies are coming to the fore such as re-evaluations and ideas examining a critical subjectivity that echo what Donna Haraway proposed as ‘Situated Knowledges’ and what the Vienna based art’s collective Monochrom call ‘Context Hacking’. Like the DADA and the Situationist artists did in their time; many artists today are re-examining current states of agency beyond the usually well-promoted, proprietorial art brands, controlling hegemonies and dominating, mainstream art systems. Most Art Says Nothing To Most People. To start things off, I want to refer to a past work that myself and Heath Bunting (co-founder of irational.org) were involved with in 1991. The above image is a large paste-up displayed on billboards around Bristol in the UK. At the time, as well as being part of other street art projects, pirate radio and BBS boards, Heath and I and others were members of the art activist collective Advertising Art. It was street art that critiqued a presumed ownership of art culture by the dominating elites. 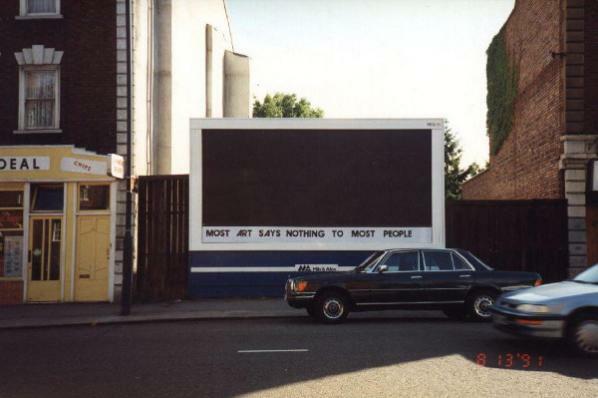 The words “Most Art Says Nothing To Most People” has remained as an inner mantra in my mind ever since. Well, a start would be to get organized and build something of value with others. As usual, it is up to those people who know that something is not working and those feeling the brunt of the issues affecting them who end up trying to change the conditions. It is unlikely that this pattern of behaviour will change. To expect or even wish those who rule and those serving them to change, and challenge their own behaviours and seriously critique their own actions is as likely as winning the National Lottery, perhaps even less. Drawing upon Sholette’s inspirational, unambigious and comprehensive critique of mainstream art culture. I would like to consider examples that are closer to home blocking avenues of artistic and social emancipation that also need an urgent critique. And this blockage resides within media art culture (or whatever we call it now) itself. Recently, I read a paper about ‘Post-Media’ – said to “unleash new forms of collective expression and experience” - which featured in its text only established names. Furtherfield is native to ‘Post-Media’ processes, a concept that theorists in media art culture are only just beginning to grasp. This is because they tend to rely on particular theoretical canons and the defaults of institutional hierarchies to validate their concepts. Also, most of the work they include in their research is either shown in established institutions and conferences. They assume that because a particular art work or practice is accepted within the curatorial remits of a conference theme, that this means the art shown is representative of what is actually happening, thus more valid than other works and groups not included. This is a big mistake. It only serves to reinforce the conditions of a systemic, institutionalised, privileged elite and enforces a hierarchy that will reinforce the same myopic syndromes of mainstream art culture. The extra irony here, is that many of these supposedly insightful art historians and theorists advocate a decentralised, networked culture in their writings, or as a relational context. However, many of them are not actually either engaged in supporting or creating these alternative structures with others. The real problem is how they acquire their knowledge. Presently the insular and hermetically sealed dialectical restraints and continual reliance on central hubs as official reference is distancing them from the actual culture they propose to be part of. Furtherfield comes from a cultural hacking background and has incorporated into its practice ideas of hacking not only with technology but also in everyday life. In fact, Furtherfield is one big social hack. Hack Value advocates an art practice and cultural agency where the art includes the mechanics of society as part of its medium as well as social contexts with deeper resonances, and a critical look at the (art) systems in place. It disrupts and discovers fresh ways of looking and thinking about art, life and being. Reclaiming artistic and human contexts beyond the conditions controlled by elites. Hack Value can be a playful disruption. It is also maintenance for the imagination, a call for a sense of wonder beyond the tedium of living in a consumer, dominated culture. It examines crossovers between different fields and practices, in relation to their achievements and approaches in hacking rather than as specific genres. Some are political and some are participatory. This includes works that use digital networks and physical environments as well as printed matter. What binds these examples together is not only the adventures they initiate when experimenting with other ways of seeing, being and thinking. They also share common intentions to loosen the restrictions, distractions and interactions dominating the cultural interfaces, facades and structures in our everyday surroundings. This relates to our relationship with food, tourism, museums, galleries, our dealings with technology, belief systems and community ethics. Donna Haraway proposes a kind of critical subjectivity in the form of Situated Knowledges. Furtherfield’s move to the heart of a North London park. Furtherfield had run [HTTP], London’s first public gallery for networked media art, since 2004 from an industrial warehouse in Haringey. 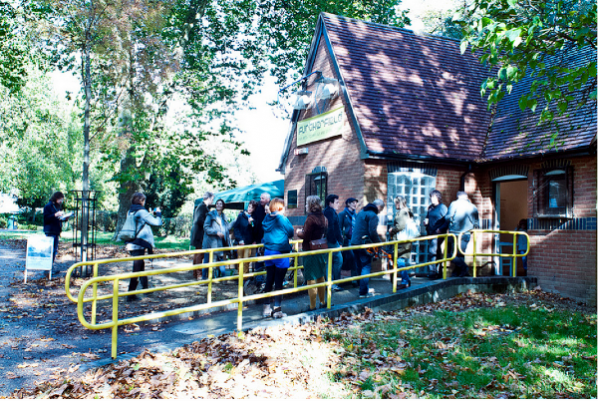 In 2012 the gallery moved to a public location at the McKenzie Pavilion in the heart of Finsbury Park, North London. However, we are not just a gallery, we are a network connecting beyond a central hub. 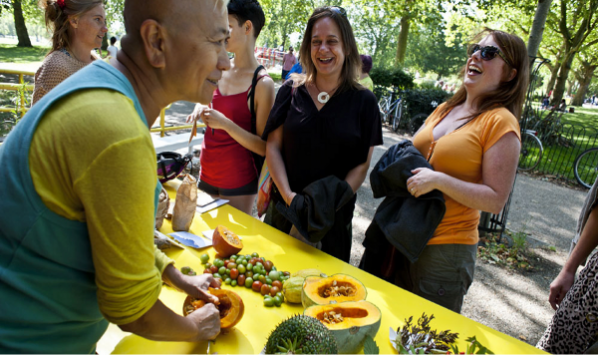 The park setting informs our approach to curating exhibitions in a place with a strong local identity, a public green space set aside from the urban environment for leisure and enjoyment by a highly multicultural population. Seeds Underground Party by Shu Lea Cheang. Aug – Oct 2013. We are simultaneously connected to a network of international critical artists, technologists thinkers and activists through our online platforms and communities, as well as a wider networked art culture. We get all kinds of visitors from all backgrounds and this includes those who do not normally visit art spaces. We are not interested in pushing the mythology of high-art above other, equally significant art practices. Being accessible has nothing to do with dumbing down it concerns making the effort to examine deeper connections between people and the social themes effecting theirs and our lives. We don’t avoid big issues and controversies and are constantly engaged in a parallel dialogue between these online communities and those meeting us in the park. We feature works that incorporate the contributions of local people and this brings them closer to the art and engagement of a social dialogue. 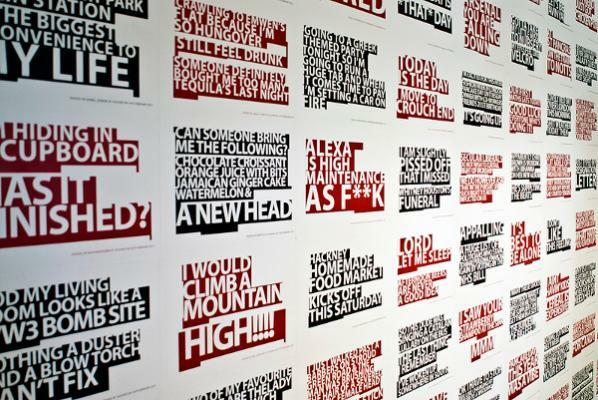 For instance, London Wall, N4 by Thomson and Craighead, that reflected a collective stream of consciousness of people all around Finsbury Park, gathering their Tweets to print out and paste onto the gallery walls. By retweeting the images of the tweet posters we were able to gather many of the original authors in the gallery to see their words physically located among others made in the vicinity. Crow_Sourcing by Andy Deck invited people to tweet animal expressions from around the world – illuminating the link between the formation of human language and our relationships with other wild webs of animal life. Gallery visitors illustrated their own animal idioms, drawing directly onto the gallery walls, inspired by the ducks, crows, squirrels and dogs that inhabit the park. We feature works that deal with the human and social effects of networked and pervasive technologies. Web 2.0 Suicide Machine by moddr_ proposed an improvement to our ‘real’ lives by providing a one click service to remove yourself, your data, and your profile information forever, from Facebook, Twitter and MySpace, replacing your icon (again, forever) with a logo depicting a noose. They also reflect on new forms of exposure and vulnerabilities they give rise to such as Kay’s Blog, by Liz Sterry, which replicated in physical space the unkempt bedroom of an 18 year old Canadian girl based only on her blog posts, to eirie effect. The intention is to reach people in a way that has people question their own relationship with those technologies. This does not mean promoting technology as a solution to art culture but exploiting it to connect with others and also critique technologies at the same time. Below: Selection of images from original slide presentation – exhibitions & events. Crow_Sourcing by Andy Deck, WWW: World Wild Web Oct – Dec 2012. Shu Lea Cheang & Mark Amerika. UKI – Viral Love by Shu Lea Cheang. Aug – Oct 2013. 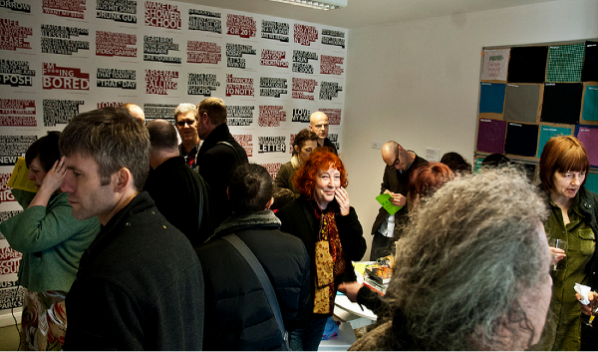 On the 23rd of November we opened our second space in the park ‘The Furtherfield Commons’. It kicked off with The Dynamic Site: Finsbury Park Futures, an exhibition by students from the Writtle School of Design (WSD) featuring ideas and visions for future life in Finsbury Park, coinciding with the launch. This new lab space for experimental arts, technology and community sets out to explore ways to establish commons in the 21st Century. It draws upon influences from 1700s when everyday people in England such as Gerrard Winstanley and collaborators forged a movement known as the Diggers also known as the True Levellers, to reclaim and claim common land from the gentry for grass roots, peer community interests. Through various workshops, residencies, events & talks we will explore what this might mean to people locally and in connection with our international networks. These include free software works, critical approaches to gardening, gaming and other hands-on practices where people can claim direct influence in their everyday environments in the physical world, to initiate new skills and social change on their terms. From what we have learned from our years working with digital networks we intend to apply tactical skills and practices into everyday life. This comprises technological and physical forms of hacking. It also includes aspects and actions of: agency-generation, skill, craft, disruption, self-education, social change, activism, aesthetics, re-contextualizing, claiming or reclaiming territories, independence, emancipation, relearning, rediscovering, play, joy, being imaginative, criticalness, challenging borders, breaking into and opening up closed systems, changing a context or situation, highlighting an issue, finding ways around problems, changing defaults, and restructuring things – Claiming social contexts & artistic legacies with others! This text is a re-edited slide presentation first shown at the ICA, London UK on 16th November 2013 (Duration 25 min). Intermediality: Exploring Relationships in Art. Speakers Katrina Sluis, Peter Ride, Sean Cubitt & Marc Garrett. Transdisciplinary Community (TDC) Leicester UK 27th Nov 2013 (45 min). Institute of Creative Technologies. De Montfort University. Ruth Catlow. We Won’t Fly For Art Culture Magazine, special themed issue Paying Attention: Towards a Critique of the Attention Economy. Special Issue of CULTURE MACHINE VOL 13 2012 by Patrick Crogan and Samuel Kinsley. Dan Hind. The Return of the Public: Democracy, Power, and the Case for Media Reform. Verso 2010. pp 155. Julian Stallabrass. Art Incorporated: The Story of Contemporary Art. OUP Oxford 2004. About the Post-Media Lab By Post-Media Lab, 20 January 2012. Metamute. Hans-Christoph Steiner. Floss + Art. Compiled and Edited by Aymeric Mansoux and Marloes de Valk. GOTO10 in Association with OpenMute. 2008. P.151. Donna Haraway. Situated Knowledges: The science Question in Feminism and the Privilege of partial Perspective. Feminism and Science. Editors, Evelyn Fox Kellor and Helen E. Longino. Oxford University Press. 1996. P.259.